Hard fighting Browns on a handmade spinning rod! Not many choices here in Maine, 99% of our lakes are locked in with thick ice. Brooks and streams are running high, so my brother and I hit a local river for some early spring fishing. 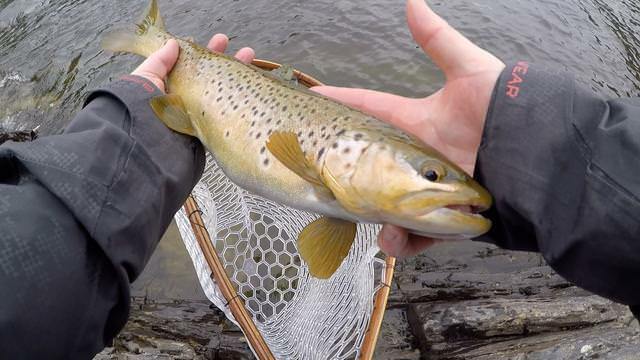 Found some solid, hard fighting Brown Trout. All were caught off a handmade rod I finished a few weeks ago. Re: Hard fighting Browns on a handmade spinning rod! On a homemade rod no less!! Great job and some beauty brownies!! Nice action Josh, you deserve some action with these latest temps. Of course it might be a bit warmer if you wait a bit to wear those shorts. 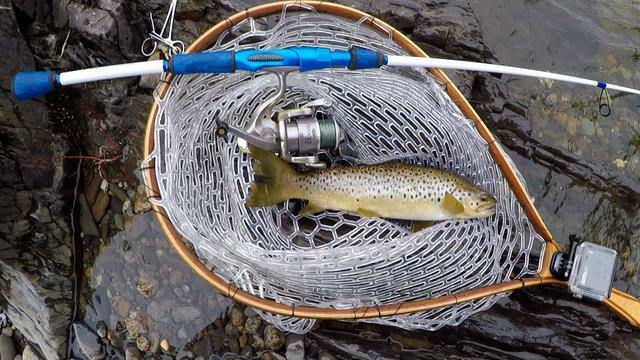 very nice brown trout, beauty! gotta love early spring holdovers! Thanks Bob. Not quite cold enough to break the pants out yet! It was moving that day, but really my only local option. I like the 3-4000 range much better. Did you tie into any? This is a good stretch, they hold in there really well. i'm surprised your 1/8th oz spinner got down to them in that current, the browns must have been cruising the slack water I guess. Not there. I actually like the water better in the 6-8,000 range like you had. I found a good option late in the day elsewhere and got a couple good fish. Most were in the eddy pools or slacker current. Nice. Glad you found a few. Nice looking browns!! Another good video to boot!